The subway is its own universe. It’s loud and brash, simultaneously flashy and dirty, with a clattering gait and a smell like yesterday’s garbage. But it’s cheaper than driving, and it gets you from Point A to Point B in a set period of time, if you catch it at the perfect interval. Not many people carry around a schedule with them that tells the set times the train arrives at each stop, but most who normally ride have already internalized it. The 8:12 train out of Mt. Airy arrives at Olney station by 8:43, and so forth, and so on. I rode the subway off and on for 21 years, and little changed in all that time. The stale air only got staler, while the bums remained just as plentiful throughout, but even more so in winter. You see, winter was always the time the subway smelled the worst, with vagrants somehow scraping together change to ride the train from end to end, then back again. It wasn’t heated, but it was underground and moving, out of the harsh elements. I would see them slumped over in their seats, snoring loudly, all of their possessions in garbage bags at their feet. And I always wanted to help, but I never really had much money of my own. I was either with my mother and sister, or I was heading to the farther parts of the city for shopping or socialization. It was something that bothered me, seeing all those homeless people on the subway, but it didn’t bother me so much that I gave up money that I had earmarked for other activities. I guess that’s the way it is with a lot of people, a hierarchy of sorts. It’s funny how now I look back on that time period and I can’t recall what I spent that money on, even though at the time it seemed of ultimate importance. The man at the City Hall station would sit on his bench selling bean pies packaged in tiny boxes that seemed inadequate to hold them inside without busting out at the seams. He wore a type of multi-colored dress with a matching hat that made him appear wiser than he may have without the hat. Sometimes my mother would buy a bean pie or two, not because she wanted to eat them but because she felt like it was supporting positivity in our city, and especially in our culture. Culture has always been important to my mother, and it didn’t stop mattering just because we were in the subway. Sometimes we would pass by long forgotten stations that still had a bulb or two that illuminated them when we would hurtle past. I would stare out the glass at the graffitied signs and the steps leading up to nothing, not anymore, and I would think about why that place fell into disrepair, why it was shut off from the journey. I would imagine I was someone twenty years previous who always got off the train at that stop. It made me wish I knew people who could get me access, so that I could document the place, but I wasn’t one of those people who knew how to trespass. I had to content myself with catching those illicit glimpses as the train passed by, on its way to someplace else. 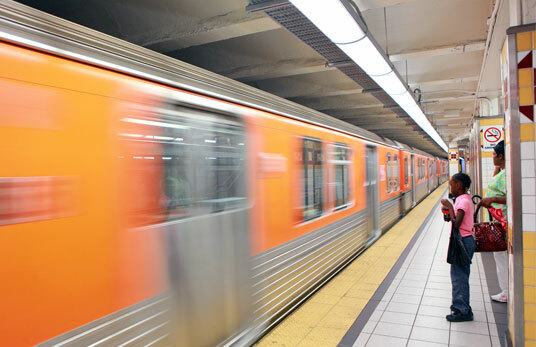 That orange train motoring into the station on a Saturday morning would contain few people, those doing the “ride of shame” leftover from the night before, the Seventh-Day Adventists heading to church, and the ones with no homes just trying to beat the rising elements. I would sidle in and take a seat facing the window, like I owned the underground. Because it felt like I did… as we roared into the next tunnel.